We already know that eating sugar is bad for our health. Carbohydrates per se are not the culprit - it&apos;s the overconsumption of carbohydrates that leads to several health issues including type 2 diabetes, heart disease and obesity. As a health-conscious person, I avoid all sugary beverages. This includes soda, juices and even zero-sugar drinks that use artificial sweeteners. These are not only unhealthy but can, in fact, indirectly cause weight gain. When you give up all these beverages, you are left with water, tea and coffee which might get quite boring. 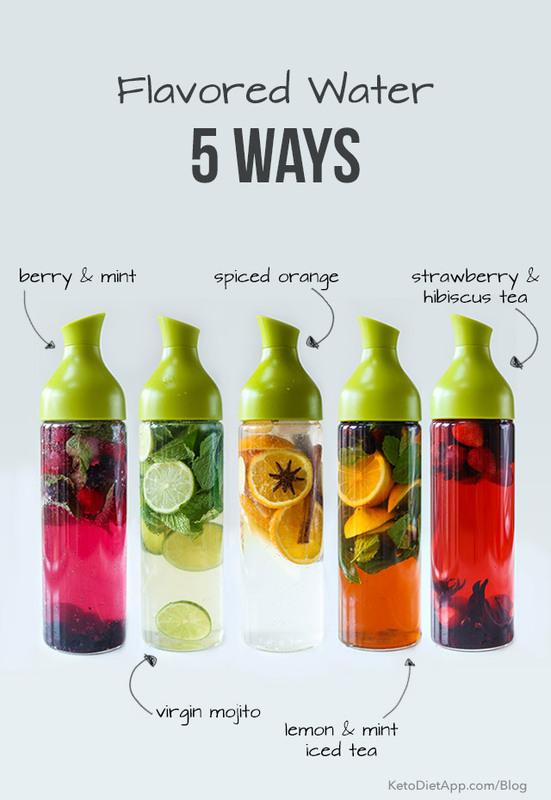 Making naturally flavoured water will help you stay hydrated and you won&apos;t miss sugary drinks. The following recipes will make up to 1 litre (1 quart) of flavoured water. Sweeteners are optional and should be used to taste. You can store flavoured water or tea in the fridge for up to 3 days. Mix 1 cup of fresh or frozen berries and a bunch of mint. Optionally a few drops of stevia such as NuNaturals and ice. Mix 1-2 limes (sliced) and a bunch of mint. Optionally, add stevia or Sukrin Syrup Gold and ice. Mix 1 orange (sliced), 1-2 cinnamon sticks, 1 star anise, and a small piece of sliced ginger. Optionally, add a few drops of stevia and ice. Prepare the tea by pouring hot water over 1-2 bags of quality black tea (or rose hip), a bunch of mint, and 1 lemon (sliced). Optionally, add a few drops of stevia. Drink hot or let it cool down and add ice. Prepare the tea by pouring hot water over 2 bags of acai green tea and 2-4 hibiscus flowers. Let it cool down to room temperature and add 1/2 cup of fresh or frozen strawberries. Optionally, add a few drops of stevia and ice. Why Use a Water Bottle? We all are so busy in our every day routines that we don&apos;t drink enough water. And that includes myself. Apart from my morning and afternoon coffee, I sometimes forget to drink fluids throughout the day, and as a result, I get dehydrated, feel tired and even get headaches. Having flavoured water at my desk helps me stay hydrated and feel energised all day long - without sugar. You can buy Ecooe products, including this water pitcher on Amazon. To join our giveaway and win an Ecooe Water Pitcher, follow the instructions below. Leave a comment below: Which other flavours would you make? All your drinks look delicious and super healthy! I look forward to trying them. These are beautiful! And, they look absolutely delicious! Can I assume, since we are not eating the fruit, that there is minimal glucose elevating effect and that these would not effect ketosis? Strawberry and hibiscus would be amazing! It can be bought in US. We also have a tea called Honeybush..the same can be done with this. Gives a natural honey flavour. That sounds great, I love Rooibos! LOVE THE IDEA OF MAKING MY OWN FRESH FLAVORED WATERS. THANKS SO MUCH. It might sound odd, but watermelon and a touch of sea salt sounds heavenly! Cucumber and Mint with Tangerine and Grapefruit!! I think cranberry tangerine would be refreshing!Berry & mint sounds really nice. I too, don't drink enough water and diet soda and coffee are what I drink. I have bought berry crystal light, to get me to drink more water, so I think Blackberry infused water sounds good. I like strong flavors and think strawberry and other light flavors, would need to sit in water longer. Maybe even puree my fruit first. The eccoe water pitcher sounds like the perfect way to add flavored water. In fact two would be good that way I'd always have cold water infused, waiting for me in the refrigerator. I enjoy my water best, when it's chilled. Great idea for getting people to drink water. Love putting cucumbers in my water!! I like to drink the berry and mint water. The vigin mojito sounds amazing! These look awesome! I am going for fresh-made almond milk, cinnamon sticks, and ice! I love any type of cinnamon or ginger spiced drinks! Can't wait to fix the spiced orange water! A strawberry lemon or lime would be delicious! Would love to make lemon mint water and lime coconut green tea! Evening in Missoula herbal tea and honey love it and it has a lot of healthy herbs in it. There is nothing as refreshing and surprising on a hot summer day as Cucumber Water! I'd make a coconut flavor. I would love to infuse fresh raspberries from my bushes next spring! Iced tea is always a favourite but I would try them all! No sweetener. Apple cinnamon ginger sparkling water! Yum. It's been a while since I've made flavoured water but I would like to try a vanilla orange or grapefruit blend. Personally, I prefer water flavored water. Ya know, the way nature intended. These look Great! Would love to try them! I love to make hibiscus ginger tea by pouring hot water over a handful of dried hibiscus flowers and a knob of sliced fresh ginger and letting it steep for 15 minutes. The combination of the two makes the drink both tart and refreshing. I also make a concentrate of this by decreasing the amount of hot water and increasing he soak time and add it to sparkling water from my SodaStream. I love flavored waters. I especially like a berry blend with mint. I use Blackberry, strawberry, and raspberry with a sprig of mint. I usually drink slices of cucumber, lemon and mint- no sweeteners for me. Just wondering... Thanks for the opp to win. The lemon and mint flavour and I grow my own lemons and mint so it is a super easy recipe anytime! I had a friend who would use grapefruit slices without the rind with mint. It was actually pretty good! I think it would be yummy to see something with ginger! I'd try a blueberry lemon or strawberry basil. Yum! Love inspiring ways to drink more water. i'm a big fan of cucumber, lemon and mint. just slice them up, and in they go. I don't need sweetener myself... but if you're struggling to enjoy it, go for it, i'd gradually reduce the sweetener, till there's none needed. I use doTERRA casia essential oil to sweeten my flavoured herbal tea. It helps maintain your blood sugar levels to not spike. It's sweet and it's good for fighting off colds, digestion, circulation, and libido. I usually just do lemon, cuz I'm pretty boring, these recipes sound great! I love flavored water and I'm a coffee addict. One of my favorites uses 1/4 cup of whole coffee beans and a crushed up vanilla bean. Add 4 cups of water and it's almost like my favorite vanilla iced coffee from SB. Another great one is pear and ginger, maybe sometimes with a thrown in cinnamon stick. rhubarb? So refreshing on a summer day! I would definitely make the lemon and mint iced tea!!!!! I'd love to have one of these bottles in time for my January diet clean-up! I think I'll try a limeade-type drink. Strawberry & Hibiscus Tea...the green from the bottle and the red flavored water is very appealing. I would drink a few in one day. OMG! The bottles look amazing! I'm quite partial to berries and limes, so I'd do a mix of raspberries, blueberries, strawberries with a touch of lime to give it a bit more zing. I enjoy a refreshing summer water of Lemon & mint... yum!!! I'd like to try bengal spice - best herbal tea ever - added to the spiced orange. I love cucumber in my water. I also love for the summer to put frozen watermelon in my water, it keeps it cold and refreshing! I flavor my water with lemon or lemon essential oil which encourages me to drink me. This ECOOE glass pitcher would be ideal~! I love apple and cinnamon. Love these recipes! I am terrible at drinking enough water on a regular basis - mostly because I prefer either bubbles or flavor in my water, but don't want to buy plastic-bottled artificially flavored stuff at the store. This could be a game changer in my hydration situation! Green tea with mint and stevia! The flavored water recipes are nice additions to remain hydrated which is a challenge for me. The water bottle has a wonderful design. Thank you for sharing. I would try something with cucumber. Fill jug about half full with boiling water. Steep at least 5 minutes. I then add 3/4 cup tonic water (about 1/2 a pop can). The quinine in the tonic helps my fibromyalgia pain. I do use sweetened pop because the only unsweetened pop I can get here has aspartame - big NO. If you don't need the pop you can sweeten with a squirt of liquid stevia. Fill jug with cold water, stir and refrigerate. Refreshing! These are great!! I love flavored water. My first choices would be Spiced Orange, then Lemon Mint. I make cucumber, orange and lime water. It is very refreshing. I would love to try peach iced tea in it. The orange spice sounds fantastic! We would try lemon verbena and cucumber...oh my! I would make the all of them. We have come to love infused water! Our friend always serves it when we eat with her. It's so simple and so delicious! This would be perfect for us. Thank you! Love learning things on this site! I would make a hot green tea with orange and cinnamon. Or ginger and orange with water. I love apple cider vinegar, limes and fresh berries..
That orange spice water sounds awesome. Thank you for introducing a new brand of products to my world! I have done peach and strawberry as well as peach and mint - both very refreshing! I love lemon and ginger. I think it would be my go to water! I drink water all day and love finding new and helpful water bottles. I love flavored water, but I worry about the artificial sweeteners in them. This water bottle looks amazing, and I would use it all the time. The berry-mint and the Strawberry and Hibiscus Tea recipes look delicious. I would love to try the berry and mint! I like to use Capella Flavor Drops to make tropical flavors like passion fruit and pineapple. This looks like something that would update the same old lemon/lime water that I have every day. It would be great to win and to try something different.